I used my mini muffin pan to create two appetizers - mac n cheese bites and pepperoni pizza puffs. The mac n cheese bites were the exact same cheesy classic everyone loves, just in a small portable form. It's a little weird eating macaroni and cheese with your hands, but once you have one it's impossible not to have another! The pepperoni pizza puffs had all the components and taste of pizza - cheese, herbs, pepperoni, and marinara sauce - but in a puffy, bite-sized form. Both of these recipes were super easy to make and the perfect size to feed lots of people as a fun appetizer. They're also both highly adaptable to whatever cheese or other ingredients you have in your fridge, so have fun with them! These are highly adaptable - try using different types of cheese (I used a blend of Mozzarella and Mexican cheeses), different seasonings, different meat, or make them vegetarian by adding in some veggies like onions or peppers. For a slightly healthier version, try these Whole Wheat Pizza Puffs from Cooking With My Kid. But whatever you do, don't forget the marinara sauce! Preheat oven to 425°F. Spray a nonstick mini muffin pan with cooking spray (you may need multiple pans). Set aside. In a large saucepan, melt the butter over medium heat. Whisk in the flour and cook for about 1 minute. Whisk in the milk and bring to a boil. Cook, whisking occasionally, for about 2 -3 minutes until thickened. Add all the cheeses and stir together to melt. Remove from heat and stir in the egg yolks, salt, pepper, and nutmeg. Stir in the cooked macaroni. 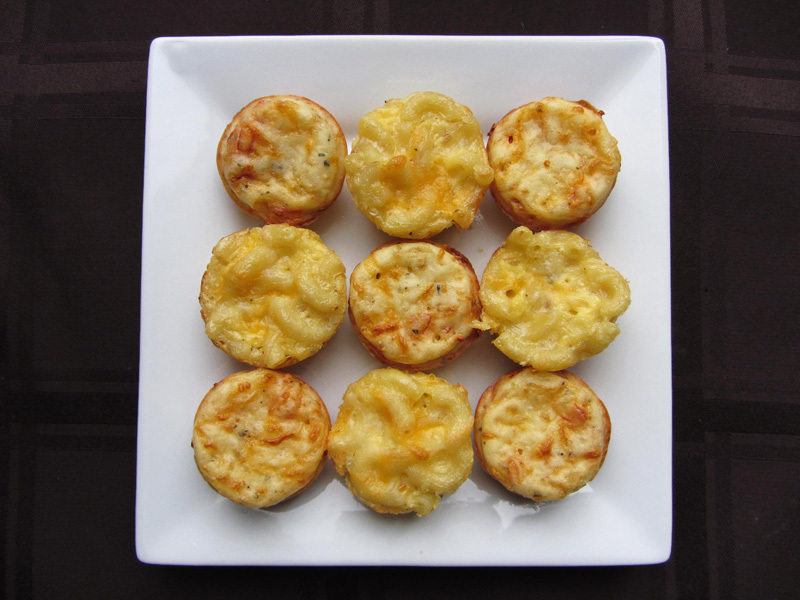 Spoon the macaroni and cheese into the prepared mini muffin pan(s), filling each cup to the top. Pack each one down gently. Sprinkle with remaining Parmesan cheese. Bake for about 10 minutes, until golden and sizzling. Let cool for about 10 minutes, then use a butter knife to carefully loosen and pop out the bites from the pan. They should pop out very easily. Transfer the mac and cheese bites to a platter and serve warm. 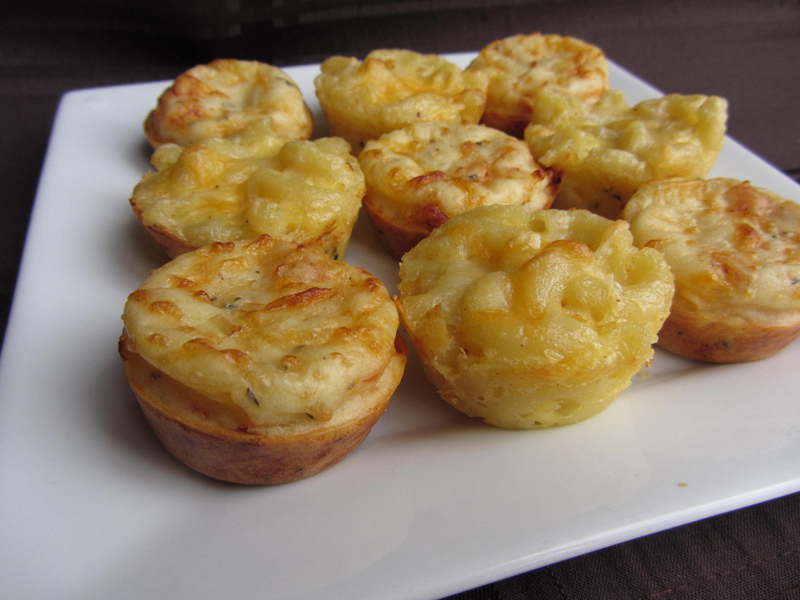 To make ahead, bake and cool mac and cheese bites then store in the fridge. When ready to serve, place the bites on a baking sheet and heat in a 400°F oven for 5 minutes until warmed through. Cute! 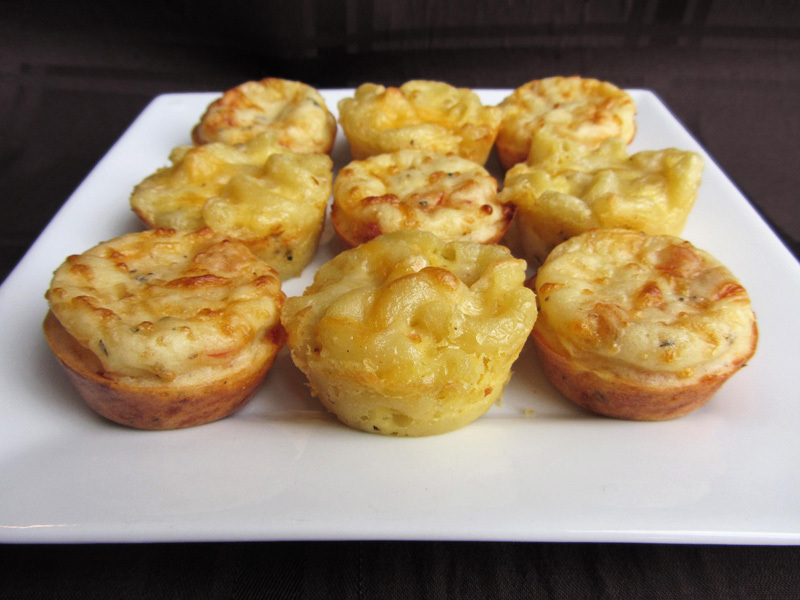 I love the idea of using a mini muffin pan for little appetizers like this. Eating these RIGHT NOW! They're so good! We were out of milk so I had to substitute with water and for flavor I added boursin cheese too which added some garlic to the flavor. LOVE these. My brother just came out for seconds. trying the mini Macs tonight. but adding some Bacon and hot links in half and ham and bacon in the other half. Hi Sue, good question! I haven't tried that myself, but I've read on other blogs that the pizza puffs take about the same amount of time in a regular sized muffin tin .. as for the mac and cheese bites, I've seen other recipes that call for about 15-20 minutes of baking time in regular muffin tins, so I'm not too sure about those ones - you might want to choose a recipe that's designed for that size tin to be sure!